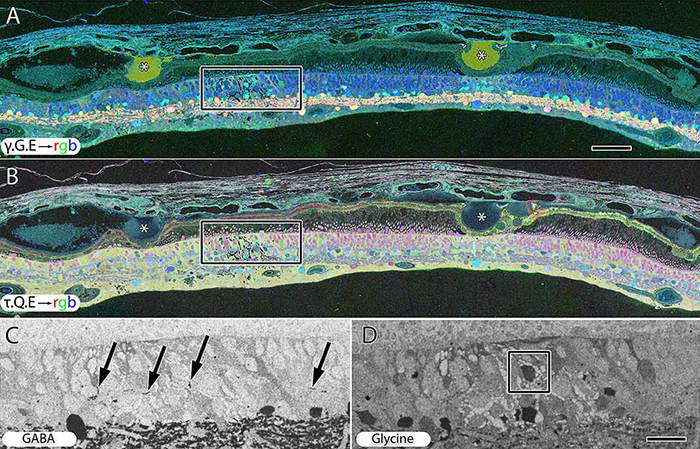 We have a new publication out (Direct Link, Free Open Access), Retinal Remodeling in Human Retinitis Pigmentosa authored by Bryan W. Jones, Rebecca Pfeiffer, Drew Ferrell, Carl Watt, Michael Marmor and Robert Marc. Abstract: Retinitis Pigmentosa (RP) in the human is a progressive, currently irreversible neural degenerative disease usually caused by gene defects that disrupt the function or architecture of the photoreceptors. While RP can initially be a disease of photoreceptors, there is increasing evidence that the inner retina becomes progressively disorganized as the outer retina degenerates. These alterations have been extensively described in animal models, but remodeling in humans has not been as well characterized. 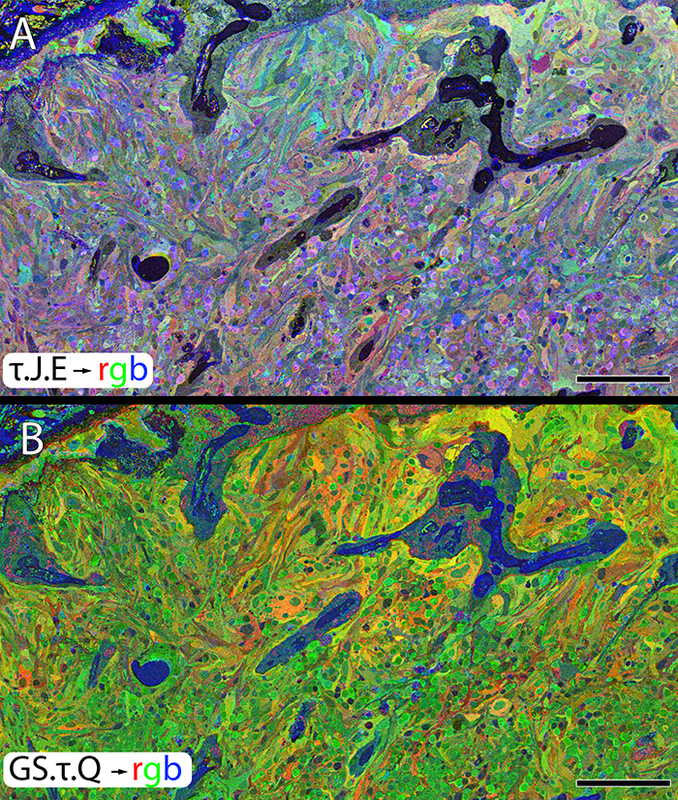 This study, using computational molecular phenotyping (CMP) seeks to advance our understanding of the retinal remodeling process in humans. We describe cone mediated preservation of overall topology, retinal reprogramming in the earliest stages of the disease in retinal bipolar cells, and alterations in both small molecule and protein signatures of neurons and glia. Furthermore, while Müller glia appear to be some of the last cells left in the degenerate retina, they are also one of the first cell classes in the neural retina to respond to stress which may reveal mechanisms related to remodeling and cell death in other retinal cell classes. Also fundamentally important is the finding that retinal network topologies are altered. Our results suggest interventions that presume substantial preservation of the neural retina will likely fail in late stages of the disease. Even early intervention offers no guarantee that the interventions will be immune to progressive remodeling. Fundamental work in the biology and mechanisms of disease progression are needed to support vision rescue strategies. This entry was posted in Publications, Retinal Disease, Retinal Remodeling and tagged bipolar cell, Bryan Jones, Bryan William Jones, BWJones, Carl Watt, CMP, Drew Ferrell, electron microscopy, human, Michael Marmor, Müller cell, photoreceptor, photoreceptors, Rebecca Pfeiffer, retina, retinal degeneration, retinal remodeling, retinitis pigmentosa, Robert Marc, RP, ultrastructure on March 31, 2016 by bwjones. This abstract was presented July 1st at the 11th International Converence of the Metabolomics Society at the University of California, Davis by Felix Vazquez-Chona, Drew Ferrell, Bryan W. Jones and Robert E. Marc. Metabolic dysregulation is an early hallmark of neurodegenerative diseases including Alzheimer’s disease and age-related macular degeneration. Mapping metabolic adaptation with cellular resolution and tissue- wide context is crucial to define networks regulating neuronal survival, cell death progression, and immune cell response. Computational Molecular Phenotyping (CMP) explores the amine metabolome (amino acids and amines). Technically, CMP metabolomics combines amine metabolite trapping, ultrathin microscopy (50-200 nm), immunodetection, pattern recognition, and clustering algorithms. Here we mapped the in situ distribution of over 30 core amine metabolites in retinal cells challenged by light-induced oxidative stress. Metabolomic profiles were phenotyped using ultrastructural, biochemical, and proteomic indices of oxidative stress. 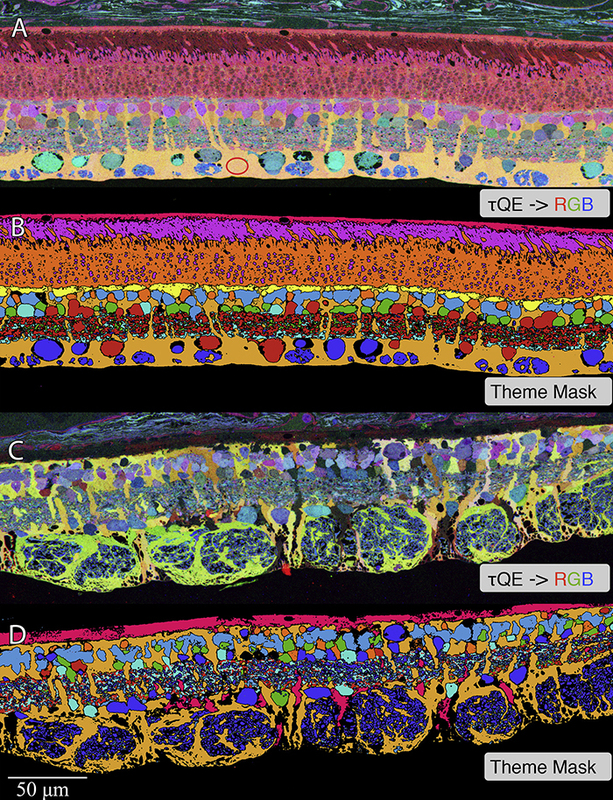 CMP enabled precise visualization of >30 metabolites in every retinal cell. CMP resolved and phenotyped metabolomic profiles to specific degeneration and microglial functional states in the light-damaged retina. Cone photoreceptor survival correlated with enhanced antioxidant glutathione content. Rod photoreceptor apoptosis coincided with rapid depletion of organic osmolytes followed by nuclear import of cationic arginine metabolites. 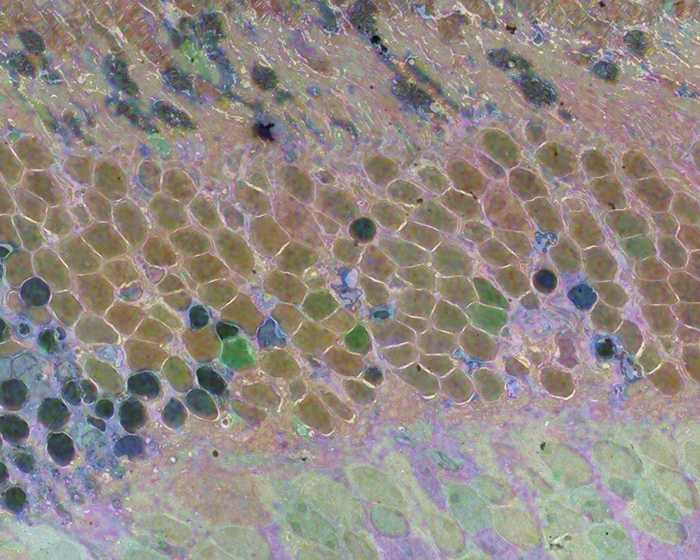 Delay in cell death increased necrosis and DNA damage-induced apoptosis. Microglial chemotaxis enhanced distinct signatures of glutamate and glutathione metabolism; whereas, phagocytosis coinduced classic (M1) and alternative (M2) arginine metabolites of macrophage activation. 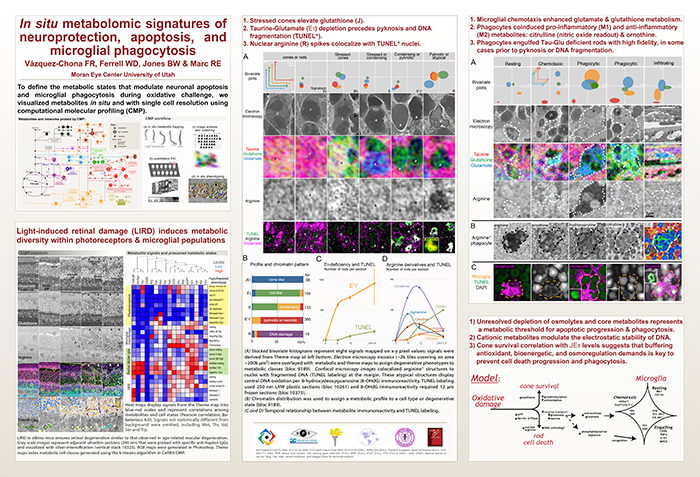 CMP discovers and phenotypes cell classes, tracks cell state, and maps disease with single-cell resolution in any tissue or organism. This entry was posted in Abstracts, Retinal Disease and tagged Bryan W. Jones, BWJones, CMP, Drew Ferrell, Felix R. Vazquez-Chona, metabolism, metabolomics, Robert E. Marc, ultrastructure on July 3, 2015 by bwjones.